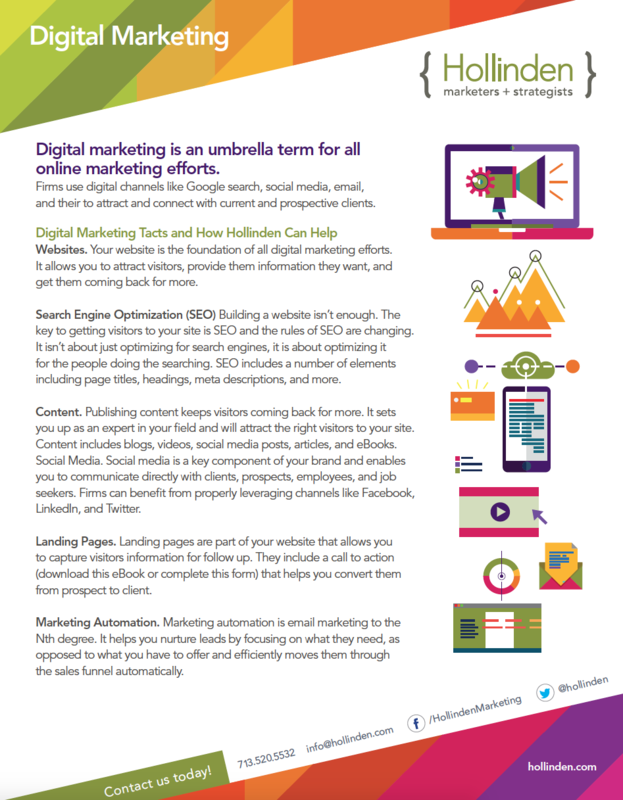 Digital marketing is an umbrella term for all online marketing efforts. Firms use digital channels like Google search, social media, and email to attract and connect with current and prospective clients. 61% of marketers say improving SEO/growing organic presence is a high inbound marketing priority. WEBSITES. Your website is the foundation of all digital marketing efforts. It allows you to attract visitors, provide them information they want, and get them coming back for more. SEARCH ENGINE OPTIMIZATION (SEO). Building a website isn’t enough. The key to getting visitors to your site is SEO and the rules of SEO are changing. It isn’t about just optimizing for search engines, it is about optimizing it for the people doing the searching. SEO includes a number of elements including page titles, headings, meta descriptions, and more. CONTENT. Publishing content keeps visitors coming back for more. It sets you up as an expert in your field and will attract the right visitors to your site. Content includes blogs, videos, social media posts, articles, and eBooks. SOCIAL MEDIA. Social media is a key component of your brand and enables you to communicate directly with clients, prospects, employees, and job seekers. Firms can benefit from properly leveraging channels like Facebook, LinkedIn, and Twitter. LANDING PAGES. Landing pages are a part of your website that allows you to capture visitor information for follow up. They include a call to action (e.g., download this eBook or complete this form) that helps you convert them from a prospect to a client. MARKETING AUTOMATION. Marketing automation is email marketing to the Nth degree. It helps you nurture leads by focusing on what they need, as opposed to what you have to offer and efficiently moves them through the sales funnel automatically.